At approximately the same time [as the Deanna Durbin note in the paragraph above this one] 20th Century-Fox signed a little girl named Judy Garland for “Pigskin Parade,” only to release her immediately [after] the picture was completed. Now under contract to Metro, Judy promised to be one of the sensations of the screen, and some compensation to that company for having let Deanna Durbin slip out of their gates to Universal. “Broadway Melody of 1938” showed that Judy is a first-rate singer of both hot and blue rhythm. Born with the surname of Gumm, she has been singing in vaudeville since she was five. She was found by a talent scout when she was doing a song and dance for 4000 children at the San Diego Exposition. January 15, 1939: More MGM fabrication. This time, Judy was allegedly a co-founder of a Hollywood skating club. 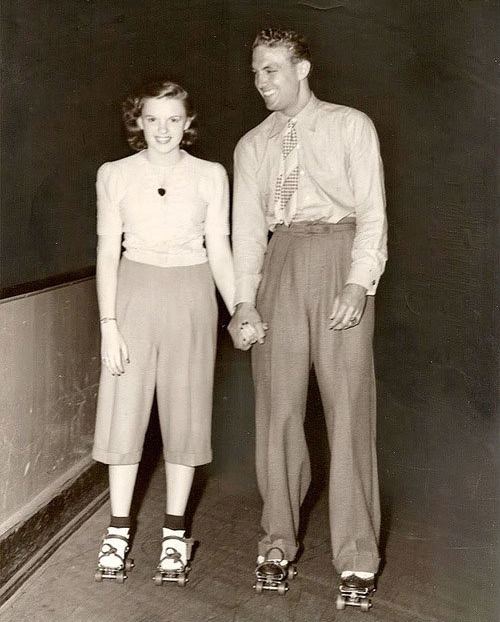 It’s doubtful Judy had much time to devote to a skating club although she was photographed with Robert Stack at a roller skating rink around this time. January 15, 1944: Meet Me In St. Louis filming continued on the “Interior Living Room” and “Interior Upper Hall” sets. 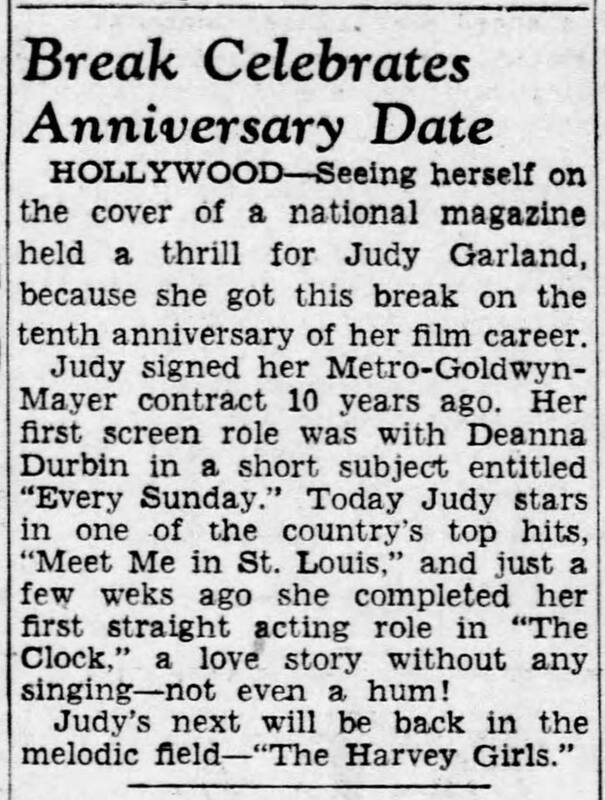 Time called: 10:00 a.m.; dismissed: 5:58 p.m.
January 15, 1945: This blurb noted Judy’s 10 year anniversary in the movie business. Officially, that is. She was signed by MGM in September of 1935 but she had already appeared in several shorts in 1929, 1930, and the summer of 1935. January 15, 1945: The Harvey Girls filming continued on the “Interior Dormitory” set. Time called: 10:00 a.m.; dismissed: 5:25 p.m. 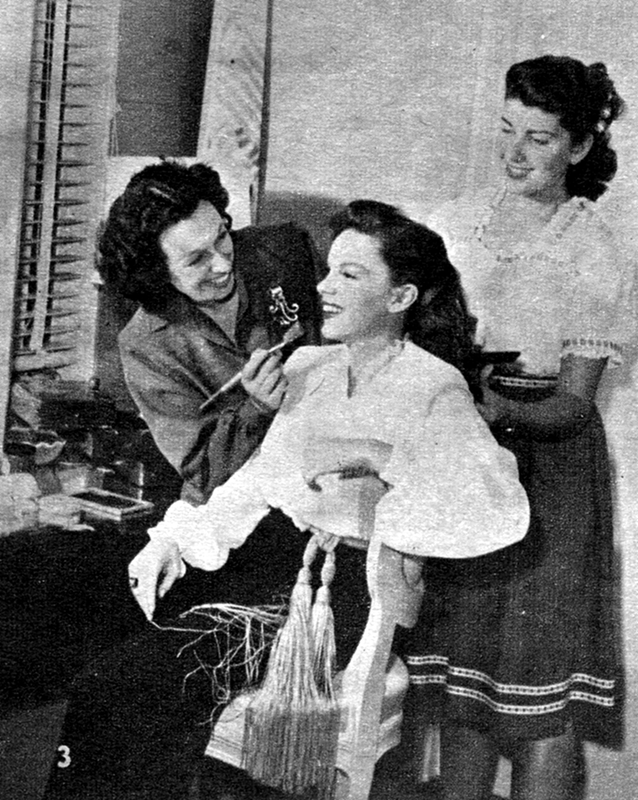 Photos: Judy in her dressing room with an unidentified woman (first pic) and her makeup woman/good friend, Dottie Ponedel (doing Judy’s makeup in the second pic). Both photos were provided by Kim Lundgreen. Thanks, Kim! January 15, 1948: Judy and Peter Lawford filmed the “Fella With An Umbrella” number for Easter Parade on the “Exterior Drugstore” set – on MGM’s Backlot #2, the “East Side Street” section. See page shown here from the “Judy on the Backlot” edition of “Garlands for Judy.” Judy was in makeup at 7 a.m.; arrived on set at 9 a.m.; dismissed: 4:30 p.m. Check out all issues of “Garlands for Judy” here. Also, be sure to check out The Judy Room’s Special Spotlight on Easter Parade here. 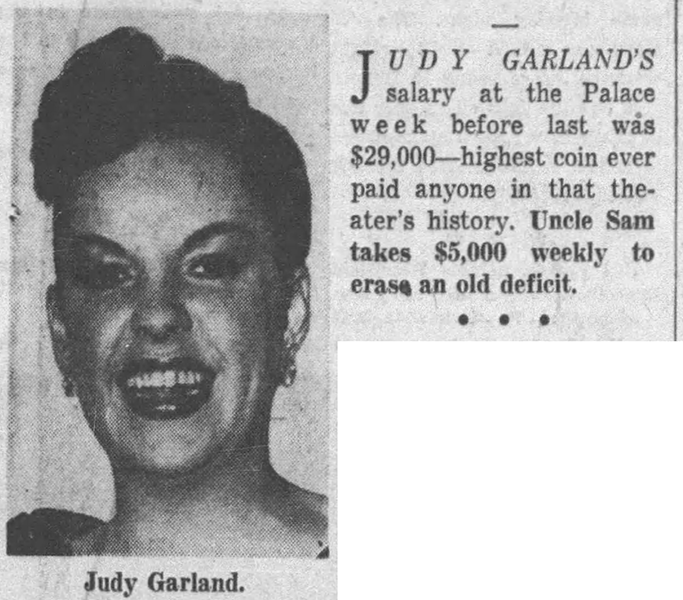 January 15, 1952: Columnist Walter Winchell reported on Judy’s salary for her engagement at The Palace, and how much was going to pay for back taxes. January 15, 1954: The second of two days of filming on the “Interior Night Court” set for A Star Is Born. 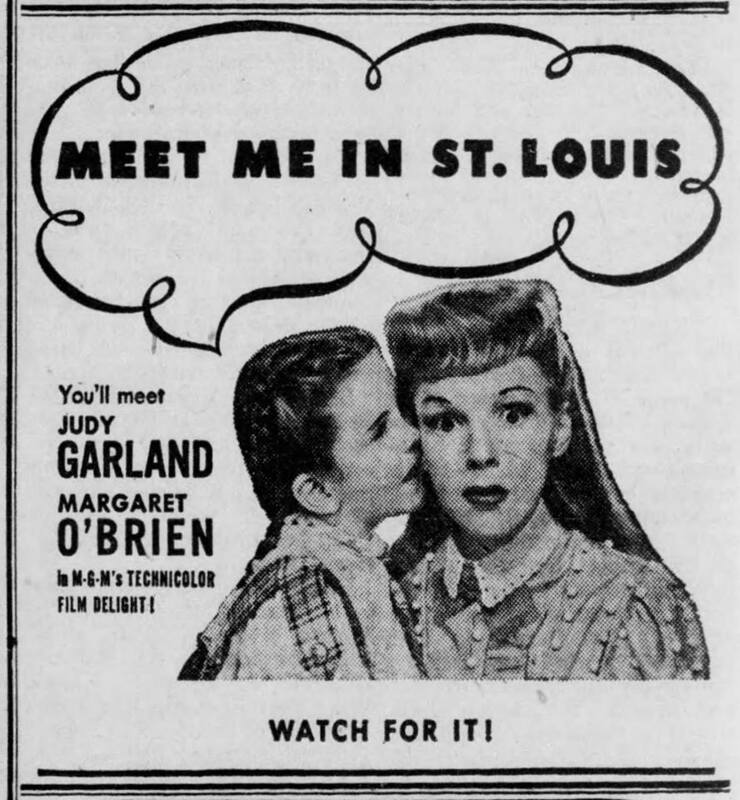 Time started: 10:00 a.m.; finished: 4:10 p.m.
January 15, 1955: Here’s a great newspaper ad for A Star Is Born. Judy was the “Best Actress” of the year on most of the critic’s and public’s lists, sometimes running neck and neck with Grace Kelly. January 15, 1957: Columnist Earl Wilson reported on the closing night of her recent engagement at The Palace and the part afterward. January 15, 1959: The first of two days of recording the Capitol Records concept album, “The Letter,” with John Ireland, the Ralph Brewster Singers, and Gordon Jenkins’ Orchestra. The LP was released on May 4, 1959, and re-released as “Our Love Letter” on September 3, 1963. 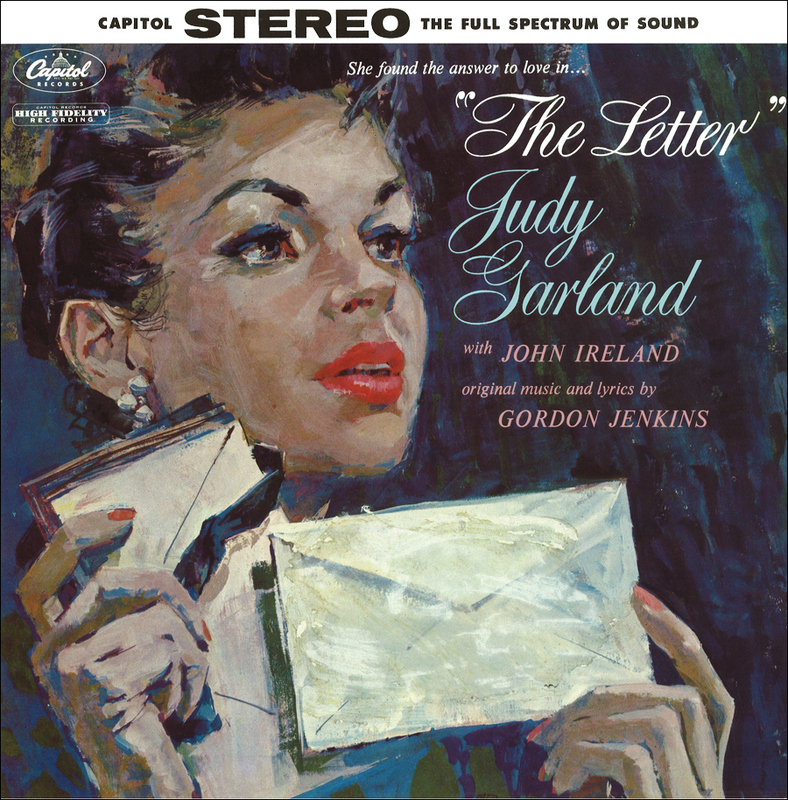 Check out The Judy Garland Online Discography’s “The Letter” pages here. 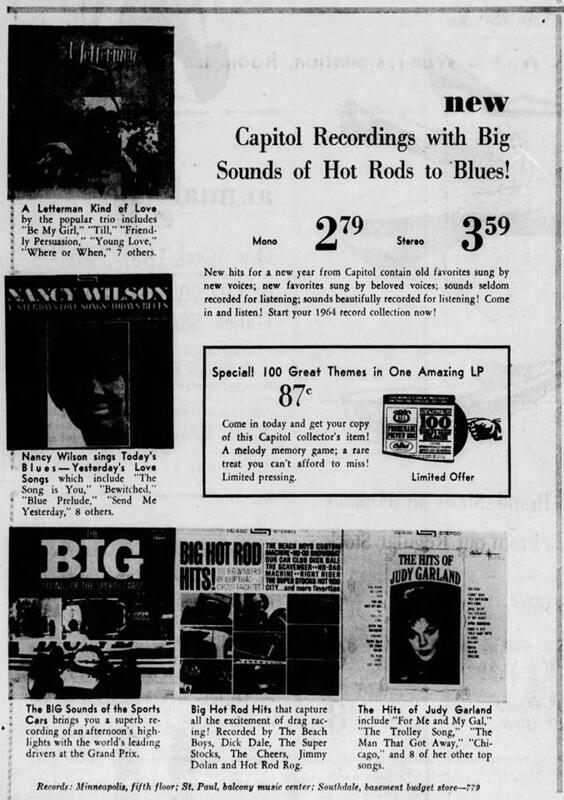 January 15, 1961: This Capitol Records Club ad featured “Garland at the Grove” as one of the available albums. Unknown to everyone, “Judy at Carnegie Hall” was on the horizon. January 15, 1962: Judy began filming her role in the Stanley Kramer film A Child Is Waiting co-starring Burt Lancaster. Filming lasted through mid-April. A Child Is Waiting was released in January 1963. 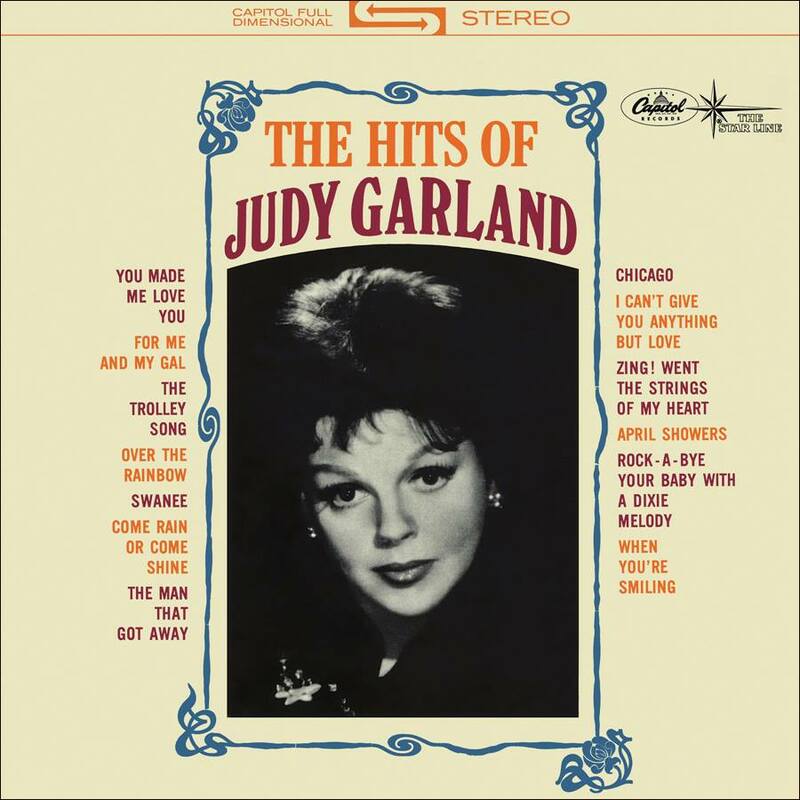 January 15, 1964: The Capitol Records compilation LP “The Hits of Judy Garland” was on sale in both mono and stereo versions. 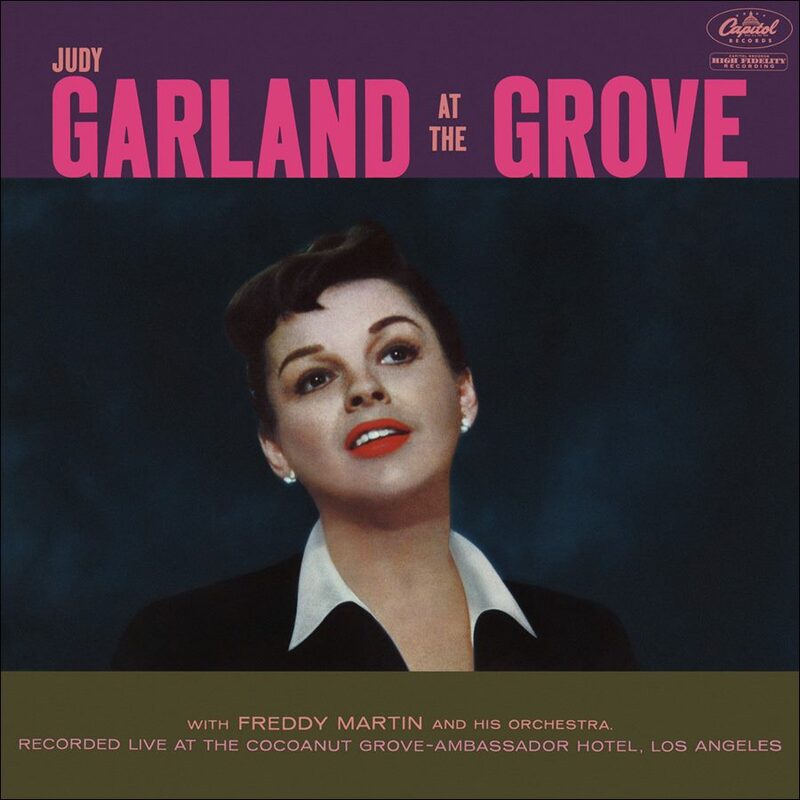 For details about the album, check out The Judy Garland Online Discography’s “The Hits of Judy Garland” pages. The album was very popular and was released in various incarnations over the next few decades. 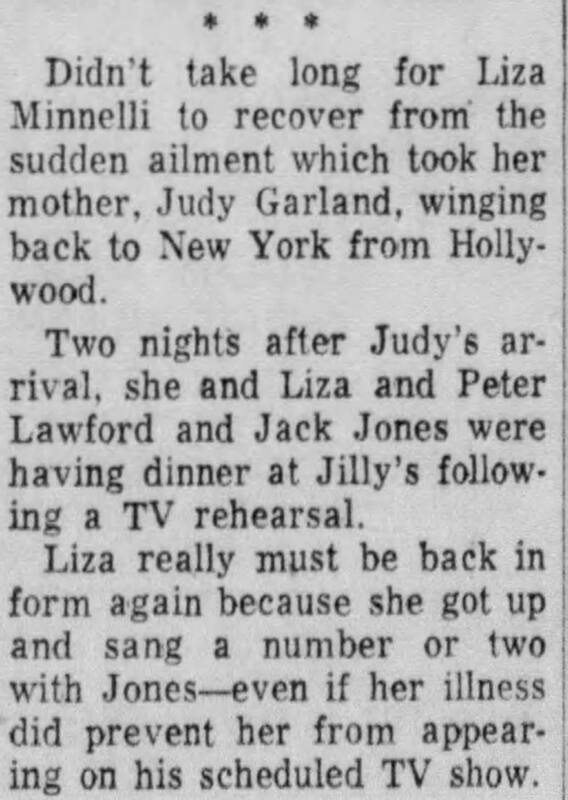 January 15, 1964: Judy’s trip from Hollywood to New York to be with an ailing Liza was noted in various papers, including Earl Wilson’s column. 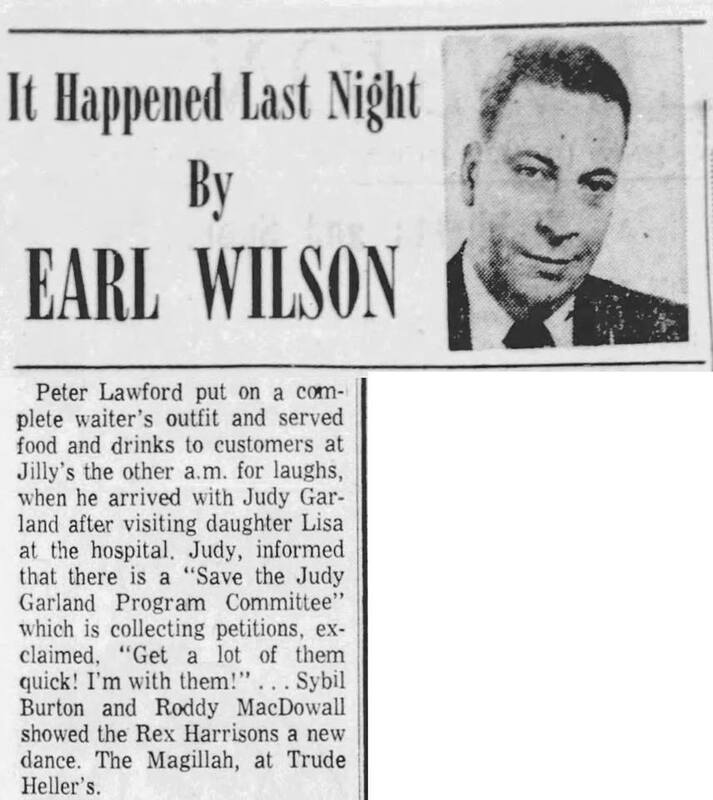 Liza recovered quickly and according to Wilson, she, Judy, and others were seen at “Jilly’s” while other notices about the event placed Liza still recuperating in the hospital when the “Jilly’s” event happened. The latter is probably truer as Liza had “kidney surgery.” She had collapsed during rehearsals for the “Bell Telephone Hour” variety show (which also starred Jack Jones) and was replaced with Susan Watson. 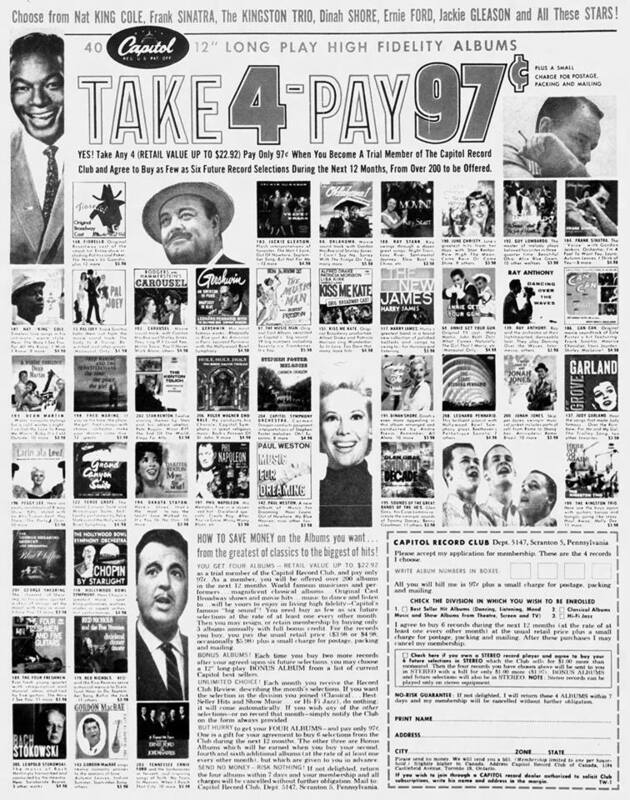 Watson was the lead in the Broadway show “Carnival.” Several ads for the show still listed Liza’s participation even on the air date of January 14, 1964. Judy was on a holiday break from the taping of her TV series and returned on January 11th for rehearsals for the next episode meaning this sequence of events happened before that time. Photos: The first is a snapshot of Judy and Liza from 1964; the rest are notices about the events. January 15, 1968: Liza’s a big star! 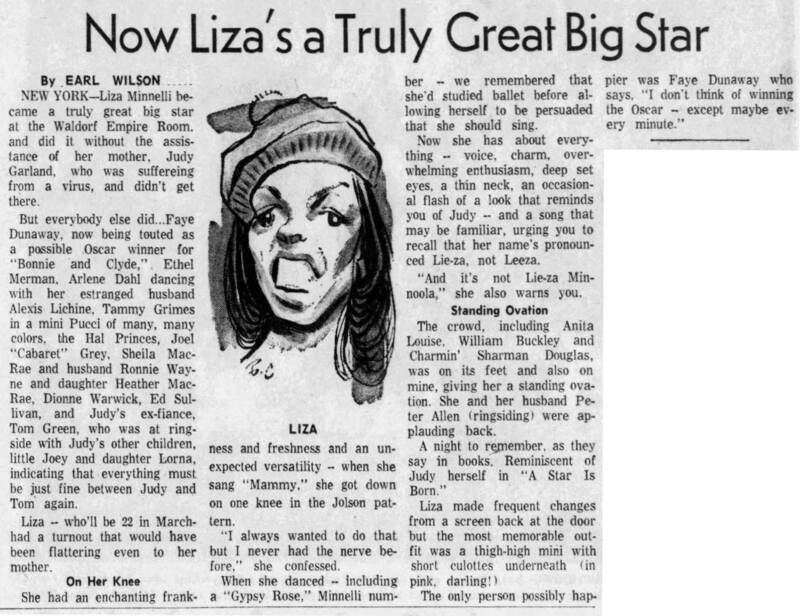 Earl Wilson’s article on this date reported on Liza’s huge success at the Waldorf Empire Room. 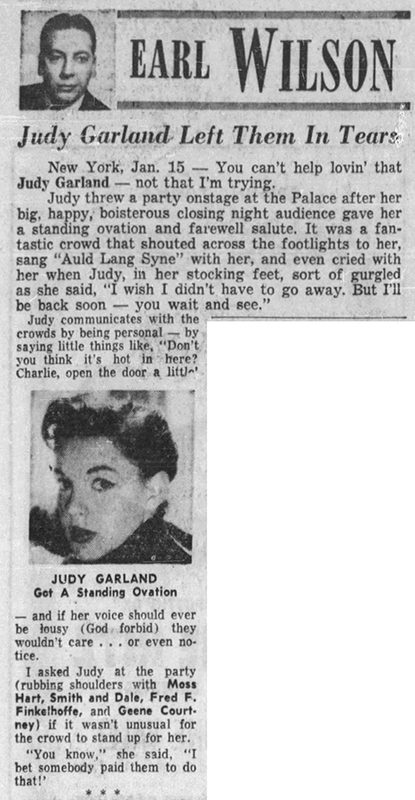 What’s interesting to Garland fans is his mentioning that Judy was not in attendance that night due to illness. He also mentioned Judy’s previous boyfriend, Tom Green, who was sitting in the audience with Lorna and Joe. Wilson surmised that Judy and Tom had patched things up. 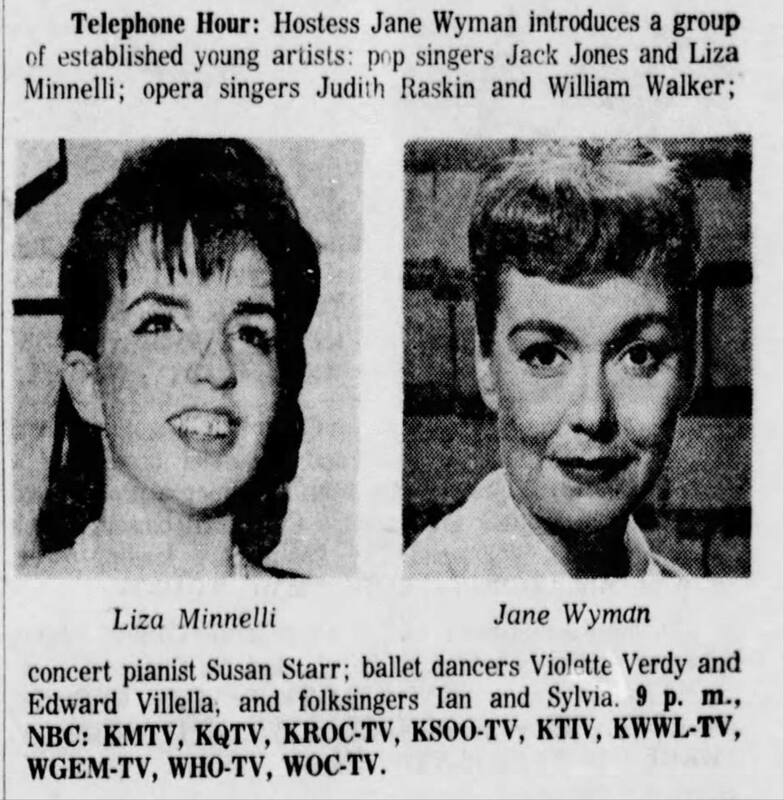 Previously, also at the Empire Room, Liza had introduced Judy from the stage, which was also reported by Earl Wilson in his regular column titled “About Last Night.” The Liza triumph article was separate from that regular column. What probably happened is that Liza’s opening night was the night Judy couldn’t make it, but she showed up after recovering from her “virus” and according to Scott Schechter’s “Day by Day Chronicle” book (the date given was “January 1968”): “Judy went to see Liza’s engagement in a New York Hotel/Nightclub, and got up to bow, and proceeded to steal the show when Liza invited her up onstage, with the crowd screaming for Judy to sing, again, and again (which, she did, of course).” None of the columns mention Judy getting up to sing they only mention Judy being there and getting a shout out, and then, of course, Liza’s big opening night success. Did some research on the radio show of January 15, 1939. 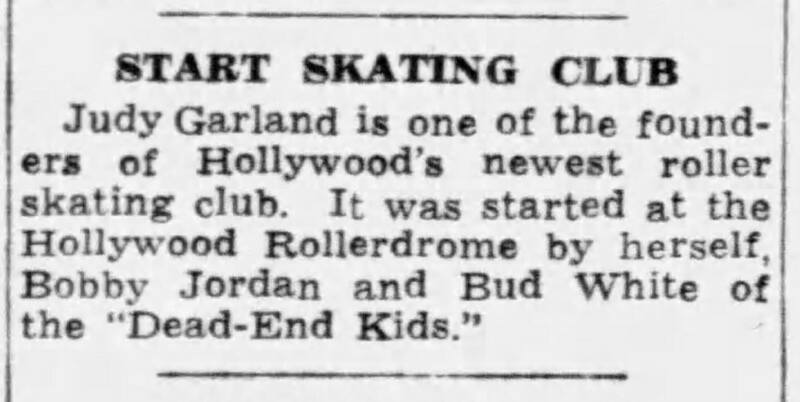 Garland isn’t in that episode despite newspaper listings. She did appear the week before (January 8, 1939) on the premiere of the Gulf Screen Guild Show. You can hear it at YouTube-https://www.youtube.com/watch?v=jWChE2Bxb-A It says Part 1 but it’s the complete show. The episode of the 15th was called “Miss Brown of Worchester” with Young and Astaire. That’s also on YouTube-no Garland. 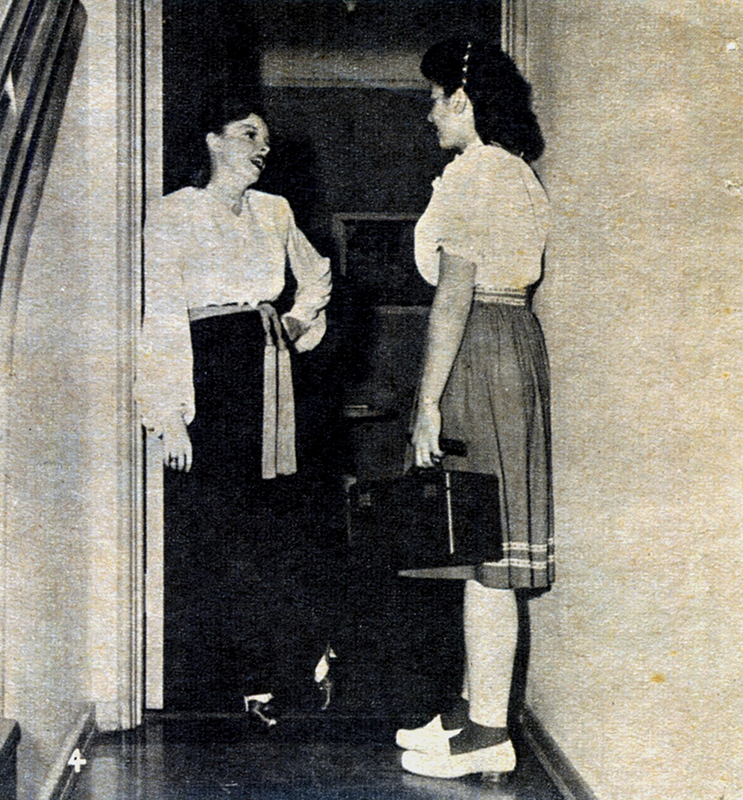 Judy also appeared on the show on September 24, 1939. Thank you for the great info! I’ll definitely make changes to the post. I appreciate the help! !